Posted by John Ruby in Uncategorized. Adjust as needed. You’ll notice that if you drag the right row to the right, more rows will blend in. Posted by John Ruby in Microsoft, Server, Software, SQL. Microsoft this week announced that it has completed the development of SQL Server 2012, the next major release of its data platform. Code-named Denali and in development for several years, SQL Server 2012 will become broadly available next month, according to the company. "Data is being generated faster than ever before, and organizations need a way to process and analyze all that data," says Microsoft Corporate Vice President Ted Kummert. "Whatever the type or size of data, SQL Server 2012 delivers the platform and familiar tools to manage data, generate actionable insights, and help drive business impact." Posted by John Ruby in BlogoSphere, Microsoft, Paul Thurrott, Platforms & EcoSystems, Windows Server. Wow! If I had to pick one word to describe my reaction to the new and improved Microsoft Hyper-V features in Windows Server 8, then wow would be it. A little smile crept onto my face when I saw all the features that will put Hyper-V on equal footing — or ahead of — the competition, from a pure machine virtualization-platform feature comparison. Posted by John Ruby in BlogoSphere, Microsoft, Paul Thurrott, Platforms & EcoSystems, Windows. Looking at Windows 8 broadly, I think the most curious and interesting thing about this new operating system is its dual–and dueling–personalities. This is most obviously seen in Windows 8’s new Windows runtime, or WinRT, which provides a Metro-style environment and the Start screen in addition to the more traditional Windows desktop. But it can also be seen in Internet Explorer 10. IE 10 is a curious beast. There are two versions of this application, really two completely separate applications, in Windows 8. One is a Metro-style app and more locked down and constrained while providing a unique full-screen browsing experience that will be useful on tablets and other highly mobile devices. The other is a traditional desktop application that looks and works much like its predecessor and is fully extensible with third-party add-ons. The two share the same rendering engines, of course, the same bookmarks, and some basic features like tabs. But the interaction between these two separate IE versions may be unclear to most users. Add a third party browser or two, or muck around with configuring a different browser as the default, and things get even weirder. So let’s discuss a few of what I consider to be IE 10’s biggest secrets. Some of these are subtle, but those who upgrade to Windows 8 in particular, this will be worth understanding. Posted by John Ruby in Microsoft, Server, Software, Solutions, Troubleshooting & Knowledge Bases. Posted by John Ruby in Archives, Microsoft, Platforms & EcoSystems, Windows. A quarter century ago, a new package called Windows faced some pretty daunting competition. Microsoft shipped Windows 1.0 on November 20th, 1985. Twenty-five years and two days later, it’s not just hard to remember an era in which Windows wasn’t everywhere–it’s also easy to forget that it wasn’t a given that it would catch on, period. The company had announced the software in November of 1983, before most PC users had ever seen a graphical user interface or touched the input device known as a mouse. But by the time Windows finally shipped two years later, after a series of embarrassing delays, it had seemingly blown whatever first-mover advantage it might have had. At least four other major DOS add-ons that let users run multiple programs in “windows” had already arrived. Posted by John Ruby in BlogoSphere, Microsoft, Platforms & EcoSystems, Windows, WindowsITPro. Gather ’round the camp fire, guys, it’s story time. And tonight’s story is a tale of redemption, a story ’bout the greatest OS ever made, a sad stretch in the wilderness, and its rebirth this year as a champion of a new generation of devices. Yes, folks, I’m talking about Windows NT. And it’s back, baby. Twenty long years ago, Microsoft raided the near-corpse of the struggling minicomputer maker DEC, taking, among other things, Dave Cutler and a cadre of his closest friends and coworkers. Cutler was frustrated when DEC cancelled the microkernel-based OS he was working on, and Microsoft offered the cure: a chance to design its own next-generation OS, called NT (for New Technology). iPads aren’t less expensive than PCs — the average selling price of a laptop computer right now is about $450, below the starting price of the iPad, which runs from $500 to $830 — and this in no small way contributed to a broad misunderstanding of how successful the device would be. But iPads are significantly simpler than PCs. And the key bit is that, for most people, they do everything expected of a more complex PC, but in a friendlier, touch-centric way. Posted by John Ruby in *New Products, CNN, News and politics. 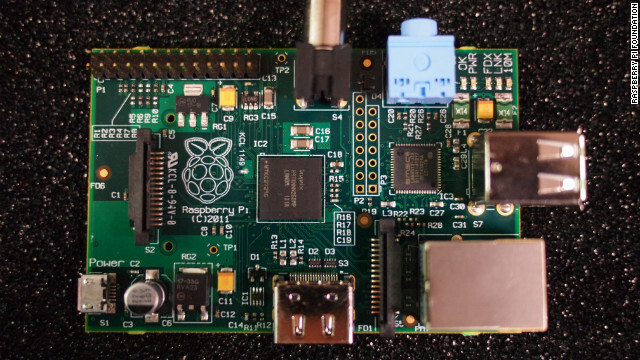 (CNN) — The debut of the tiny $35 Raspberry Pi computer crashed its distributors’ websites on the way to selling out within hours of launch. Looking like little more than a credit card-sized chip of circuit board, the powerful, fully-programmable PC can plug into any TV and can power 3D graphics and Blu-ray video playback. Its British-based designers at the Raspberry Pi Foundation hope the computer, which has been in the works for six years, will spark new interest in programming among children. "The primary goal was to build a low cost computer that every child could own, and one where programming was the natural thing to do with it," said co-founder Robert Mullins . Posted by John Ruby in BlogoSphere, Microsoft, Platforms & EcoSystems, The Verge, Windows. During today’s Windows 8 keynote, Microsoft showed off a previously-known Enterprise features like Windows To Go, which allows a computer to boot into Windows 8 off of a USB stick. Microsoft also demoed "Storage Spaces," which allows a Windows 8 machine to act as a hard drive array, providing simple, massive storage to any computer on the network. It seems as though there’s yet more to Windows 8 Enterprise that the company has yet to reveal, but more will be revealed next week at the CeBIT conference in Hanover. The conference begins on March 6th and The Verge will be there to bring you all the details from the next Windows 8 event. Microsoft also emphasized that enterprise users will benefit from the fact that Windows 8 offers the same experience on all manner of devices, from very small to very large and powerful. It’s a theme that the company hit on consistently throughout the entire keynote, and very likely going to be one of the big talking points when it comes time to directly compete with Apple’s iPad ecosystem. That’s a great diagram showing how the ecosystem has reach in many spaces. Jeremiah Grossman is the kind of guy you’d expect to be super paranoid when it comes to computer security. He was on the front lines at Yahoo more than a decade ago when a hacker named MafiaBoy was abusing the site with DDoS attacks. Now Chief Technology Officer at security consultancy White Hat Security, Grossman spends his time fighting web intruders for his company’s clients. When it comes to computer security, he’s paranoid — and for good reason. He’s seen what the bad guys can do. But when he met with Wired at the RSA Conference in San Francisco this week, he said something surprising: He doesn’t use antivirus software. Great detailed article that is very correct on not necessarily needing anti-virus software. A properly configured Windows computer can very very virus resilient in conjunction with a properly educated user on the system. I will be publishing a full article in the near future.